Cash is a proxy for the freedom to maintain some privacy in an era of Big Brother repression, surveillance and the suppression of dissent. Our first question should be: just how big a share of our financial universe is cash? The answer is: vanishingly small. 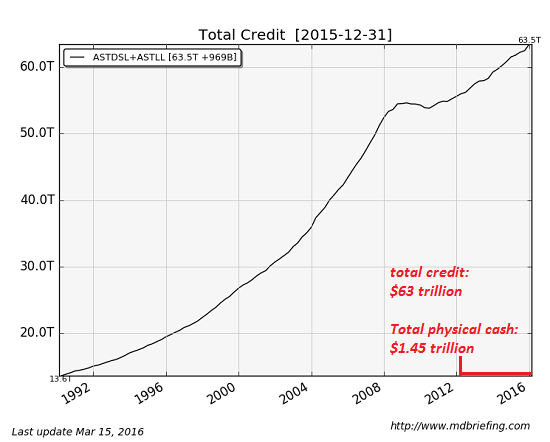 Look at this chart of total credit in the U.S. economy–$63 trillion–and total cash: $1.45 trillion. Cash is the thin red line at the bottom of the chart–it barely registers. Meanwhile, total household/non-profit-sector financial assets total $70.3 trillion (net $55.8 trillion minus liabilities of $14.5 trillion). Total money (currency in circulation and demand deposits) is over $10 trillion. If cash is such a small share of money and assets, why are governments so keen to ban cash? The official answer is to limit money-laundering by drug traffickers and criminals. But laundering money through official banking channels is not that difficult, so cash is not necessary for laundering. Another official reason is tax evasion. But tax evasion is now so easy, once again cash is not required: The World’s Favorite New Tax Haven Is the United States: Moving money out of the usual offshore secrecy havens and into the U.S. is a brisk new business. So if large-scale money-laundering and tax evasion no longer require cash, why are governments so anxious to ban cash? The simple answer is to eliminate small-time tax evasion by making every transaction visible to authorities. This raises the obvious question: how much extra tax revenue would be raised by eliminating cash purchases at swap meets, garage sales, farmer’s markets, etc.? Let’s face it–the revenues gained would be modest, as many of the people using cash don’t earn enough to pay much income tax anyway. As for drug-related transactions–does anyone seriously think a buyer of street heroin is going to log the sale electronically via a debit card? Or that the dealer would digitally transact the purchase as “heroin, sold by ABC Dealers, Inc.”? The real goal behind calls to eliminate cash is to limit our freedom to opt out: to drop out of the entire must-get-a-paycheck-and-pay-payroll-taxes lifestyle that supports the status quo. As I have often noted, a very common response to the decay of the Roman Empire was to opt-out / drop out: in effect, stop working for the Man, stop paying taxes and stop borrowing money. As taxes rose to crushing levels, productive people fled to monasteries or the relative protection of large estates (whose wealthy owners naturally evaded taxes), or simply went off the grid. This is known as Voting With Your Feet (August 14, 2015). There are many ways to opt out, and most involve reducing expenses, living low to the ground and developing multiple income streams. Cash is integral to this lifestyle, and not just for purposes of tax evasion: cash is a proxy for the freedom to maintain some privacy in an era of Big Brother repression, surveillance and the suppression of dissent. For the record, I am a proponent of rendering under Caesar that which is Caesar’s, i.e. paying all taxes owed to the various levels of government. Evading tax is personally beneficial, but it simply increases the burdens on those who are unable to skim/scam their way out of taxes. Ultimately, the war on cash is all about increasing control by eliminating privacy and the freedom to abandon the debt-serf rat-race. I should have the right to conduct my business with cash and pay my taxes digitally. Cash is necessary to maintain some modicum of privacy in an age of all-pervasive financial repression, surveillance and the suppression of dissent. Readers of my book A Radically Beneficial World will not be surprised to find that I see crypto-currencies as playing an increasingly important alternative role in a world of state-sponsored financial repression.